Fed up with cooking for everyone over the festive season? Well, now you can go head to head and create a feast for the halflings and win the title of Master Cook at the Festo! Place the game board in the centre of the table, making sure you have the correct side - player count is shown in the bottom right of the board. 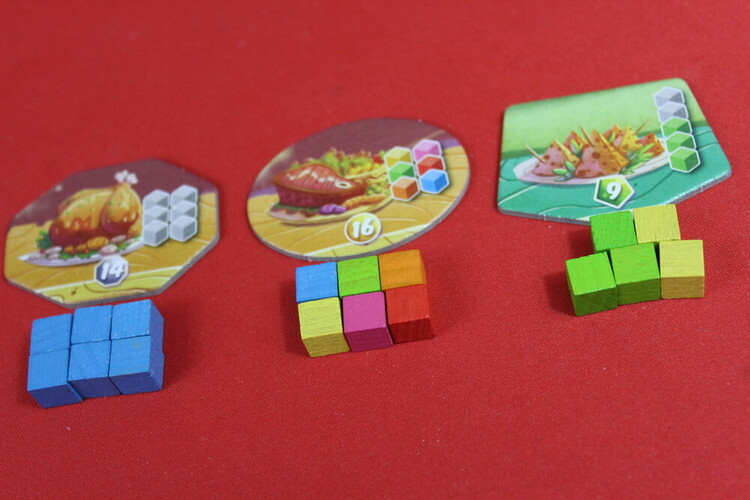 Place fourteen ingredients of each colour on the supply of the matching colour - also place the white cubes onto the magician's supply, place one more cube than the number of players eg four cubes in a three player game. Sort the different dishes and shuffle each pile, place three face up on the marked spaces with the draw pile at the end of each row. With the silver and gold dishes at the top (Roasts and Main Courses) only put as many on each pile as there are the number of players eg in a four player game, have four in each pile. There are six characters available for worker placement throughout the game, each with a different action. #1 Troll - You may move one ingredient from one market or the grocery store onto another market. #3 Orc - You may move one of your workers from here to an unoccupied dish, this dish is now unavailable for your opponents and will cost you one less ingredient when you cook it. #4 Magician - You may take one white cube (salt) This counts as a wild ingredient and can be used in place of any other ingredient. #5 Elf - Place one ingredient back in the supply and take any other two ingredients. 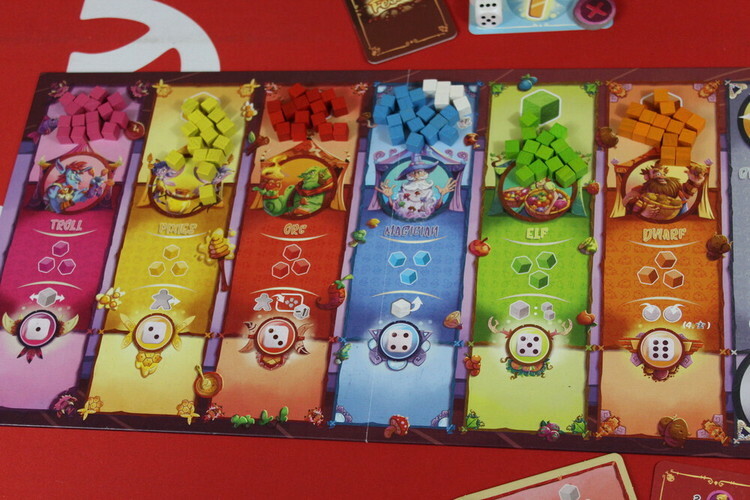 #6 Dwarf - You may immediately place your two special discs in any area of the board, they are treated as standard workers for the next round. 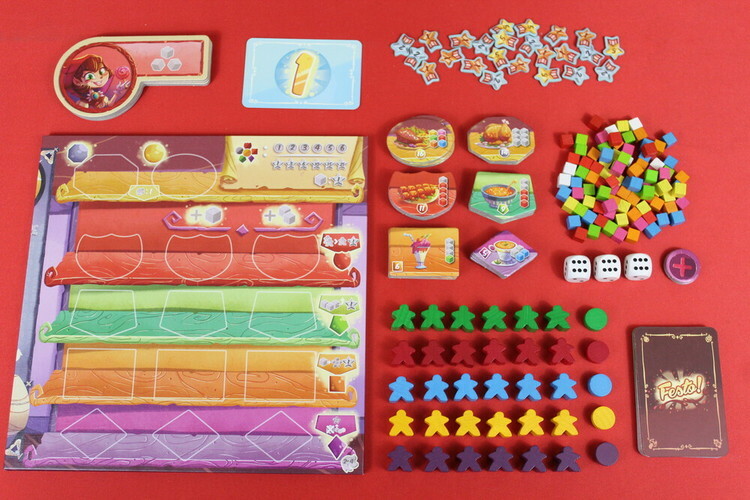 Give each player a player aid, player board, six workers and two discs in their chosen colour. Give the start player the start player card, the three dice, and the three cover tiles. Shuffle the event cards, draw four of them and place them in a face-down draw pile next to the board and return the rest to the box. You are now ready to play! 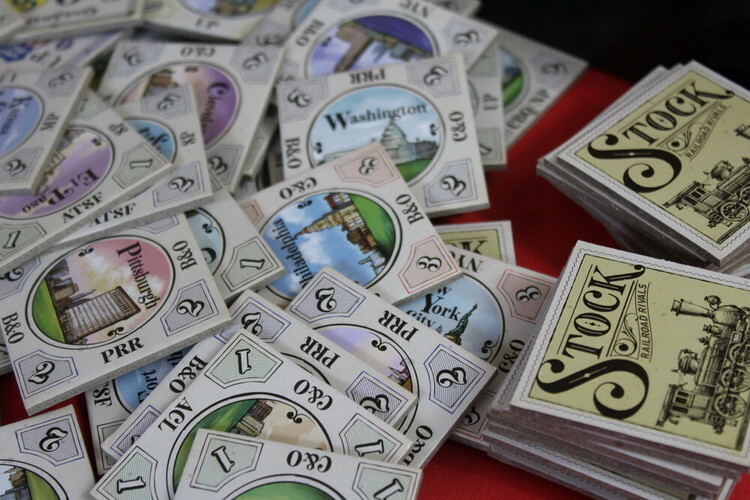 The game is played over four rounds, each consisting of four phases. 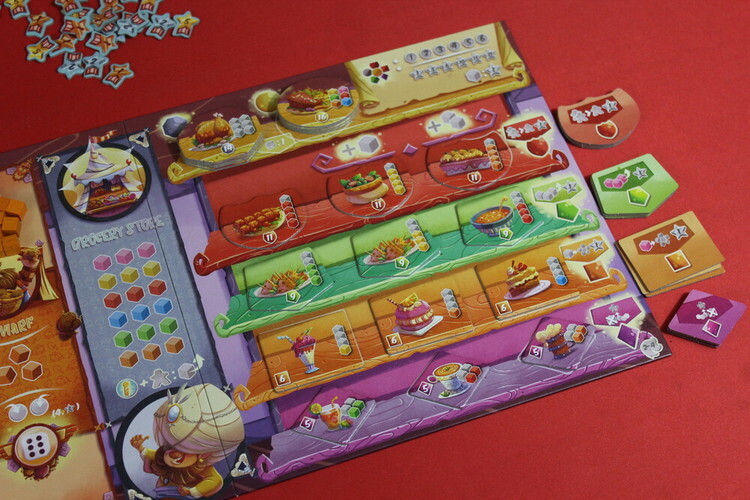 Preparation Phase - Add ingredients from the supply onto each character (three on each or four in a five player game) upto a maximum of five ingredients each. Add one ingredient to each grocery store shelf. If there are empty spaces in the dishes area, move the remainder to the left and add new dishes. Reveal the top card from the event deck and apply it’s effect (if appropriate) Then the start player may choose a new start player by giving the card to another player of their choice, or they may decide to keep it for themselves. The start player then takes the dice and cover tiles. Shopping Phase - The shopping phase is split into Morning and afternoon parts. In the morning the start player rolls the dice and places the cover tiles on the numbers rolled. 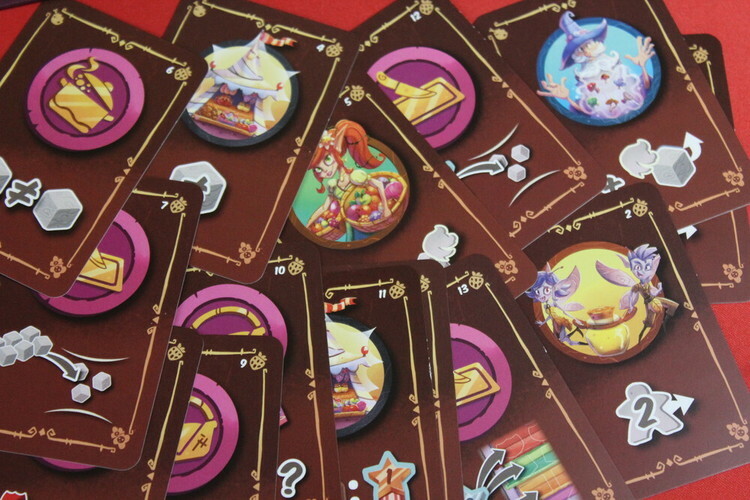 These characters are unavailable for this part of the turn. Beginning with the start player, take it in turns to place any number of workers on an available character space or the grocer. At any point, you can choose to pass and save your remaining workers for the afternoon part. Once all players have passed, move onto the afternoon. Again, the start player rolls the dice and places the cover tiles on the numbers rolled. Play continues until everyone has placed all of their workers. Action Phase - Starting with the Troll on the left and working along the board, perform the actions for each character in turn. 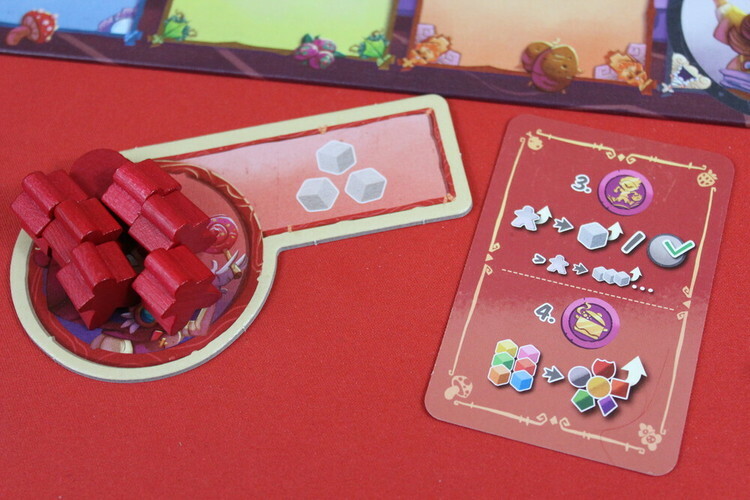 If a player has a majority on the space they may choose to use all of their workers to take all ingredients from the space. Then, all players with one worker on the space may remove one worker to take the characters ability. Finally, for each remaining worker, players may choose to take one ingredient from the space (if left available) Play continues across the board until all six characters have been used. Then, move onto the grocery store. The player with the most workers on here receives the start player card. This changes the turn order from this point in the turn. For each worker you have here, you may take one ingredient. However, they must all be the same colour so the maximum possible to take here is three. Cooking Phase - In player order, players get to cook up a dish of their choice. Simply, choose an available dish and put the required ingredients back into the supply. Take the dish and place it face up in front of you. You may take multiple dishes in this phase, but only one at a time in turn order. Any dishes with multiple grey squares shown must be paid for with the same ingredients. For example, if a dish shows two blue cubes and two grey cubes you could pay four blues or two blues and two pinks/yellows etc. This phase ends when no players want to cook any more dishes and a new round begins unless this was the fourth round in which case final scoring begins. In case of a tie, the player with the most dishes wins! Festo is certainly a feast for the eyes. It is such a nice change to see a great mid-weight game with bright colours and cute characters. 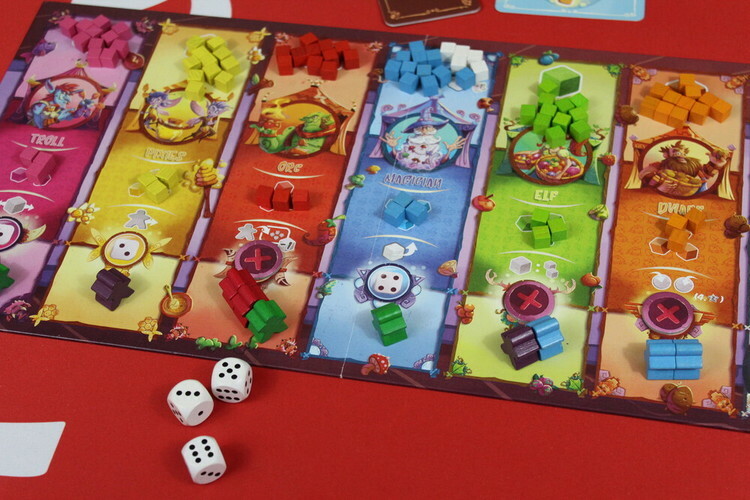 Festo is a surprisingly tactical game, you may need specific ingredients that are locked out due to the dice rolls and have to change tactics. Getting majorities in areas can be tough due to only having six workers but the abilities are tasty (yes, bad pun intended!) This game contains elements of worker placement, area control and pick up and deliver and maintains. Festo manages to combine all these mechanisms and not feel a jumbled mess. There are elements of luck in this game due to the event cards and the dice roll, but it can all be mitigated through other actions so never feels too luck based.